Water Authority maintenance employees John Brown and Bobby Bond Jr. ready to compete at the National Skills Roadeo in Kansas City, Missouri. 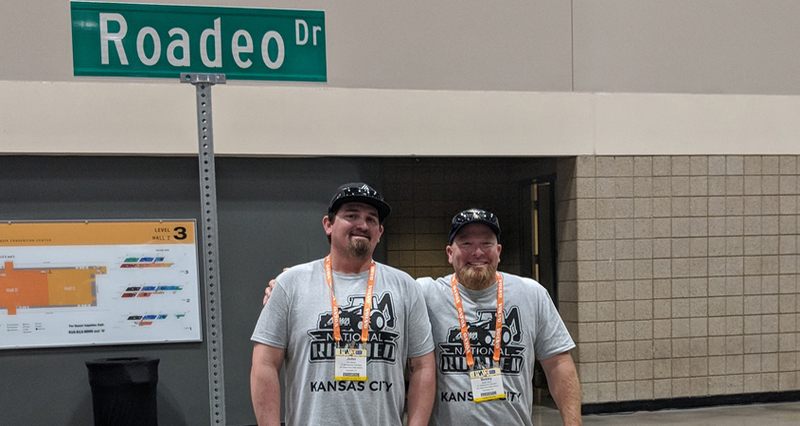 Photo: Courtesy Bobby Bond Jr.
Two maintenance pros representing San Diego brought home awards from the 2018 American Public Works Association’s National Roadeo Skills Competition in Kansas City, Missouri , in late August. 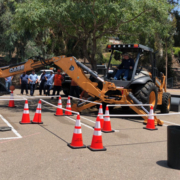 The San Diego County Water Authority’s Bobby Bond Jr. placed second in the backhoe/mini-excavator event, while John Brown, also of the Water Authority, placed third in the skid steer competition. 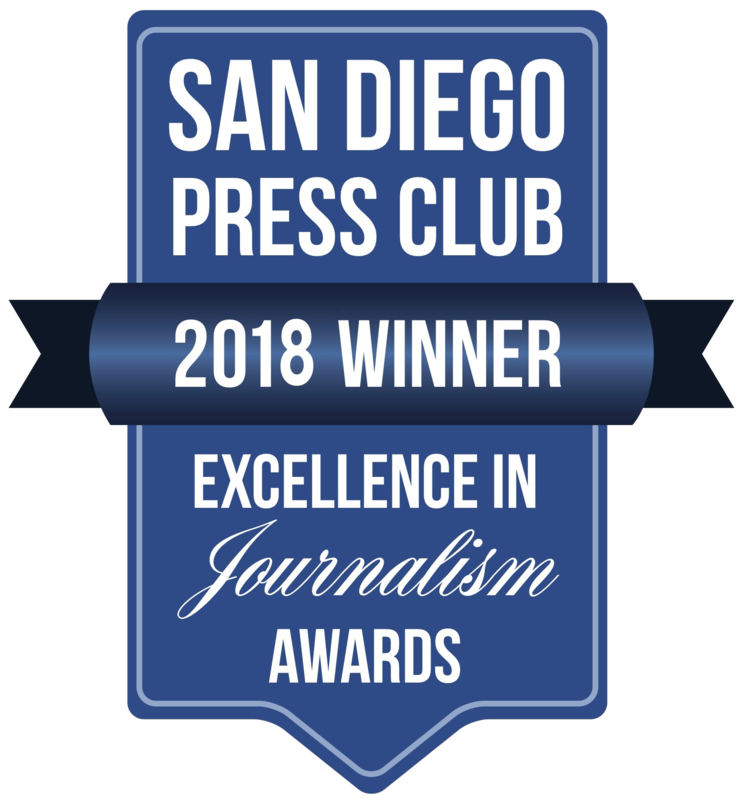 They are the only winners from west of the Rockies, and the only two winners from a single agency nationwide. A record number of 86 participants competed in three categories of competition: the backhoe/mini-excavator, skid steer, and mechanics. Each competition fielded 50 to 55 participants. Organizers ran through the rules and provided an orientation to the three categories of competition, as well as a tour of each course. Finally, all of the competitors drew numbers to determine their starting order. 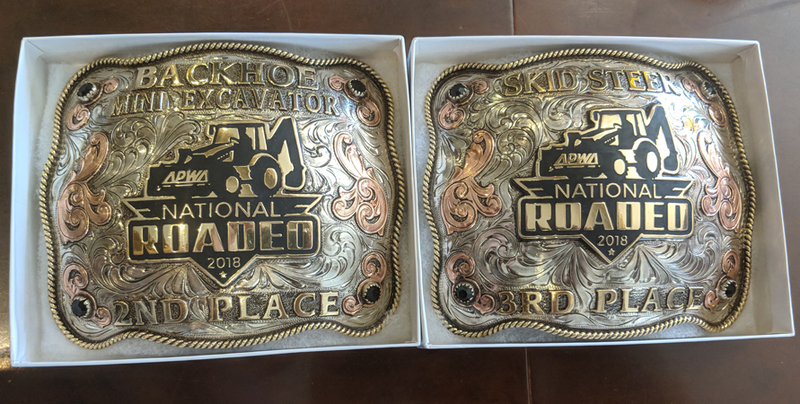 Winners received engraved belt buckles as prizes. Photo: Courtesy Bobby Bond Jr. Bond competed in the skid steer category early, which served as a warm-up for the backhoe and the mini-excavator tests. Despite incurring a 25-second penalty for dropping a section of PVC pipe, Bond’s time through the course was 3 minutes, 3.2 seconds with minimal faults, earning him the second place finish. John Brown placed third despite an unusual hiccup. While he was competing, his mini-excavator ran out of fuel on the second obstacle. He was allowed to restart on a replacement machine, earning Bond’s admiration for remaining cool under pressure. Brown’s final time was 1 minutes, 55.8 seconds, with no penalties assigned. Both the national and regional competitions mimic skills that Bonds, Brown and thousands of other employees use each day on the job while maintaining water and wastewater systems, streets, and other vital infrastructure. 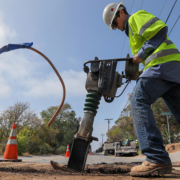 Bond says he intends to return for local and national competitions in coming years – and he aims to compete for the Water Authority when the National Roadeo Skills Competition returns to San Diego in 2022.